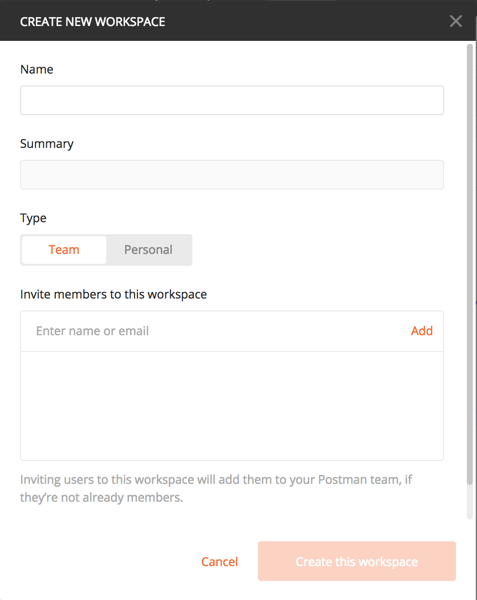 Postman allows all free users to collaborate with their teams through Team Workspaces. Using this feature, you can easily collaborate and share your Collections, Environments, Integrations, History, Mocks, Monitors, and more. Note: Free Collaboration is available in Postman version 6.2 and above. Please upgrade to version 6.2 or above to use this feature. Postman offers an upper limit on the number of collection requests and history shares. 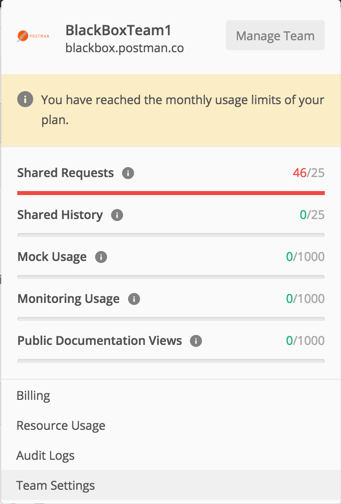 For more information on the usage limit, refer to the section Usage Limit for Free Users. However, note that Postman does not impose any limit on the number of people you can invite. Enter the email id of the person you’d like to invite to your team workspace and click Add. Once the email appears as shown below, click Invite to team button. The invitee will be part of the team after accepting the invitation. Note: My Workspace is a special workspace created by default by Postman. This workspace works differently from your personal workspaces as it cannot be shared with anyone. You can only share the personal workspaces that you create by inviting your team members to it. When you invite a member to your personal workspace, note that Postman converts it into a team workspace. You can straightaway create a team workspace using Create New option in the Workspace Switcher. Specify a name in the Name field. Input any details for Summary and select Team under Type. The Team option appears highlighted in orange color indicating its selection. 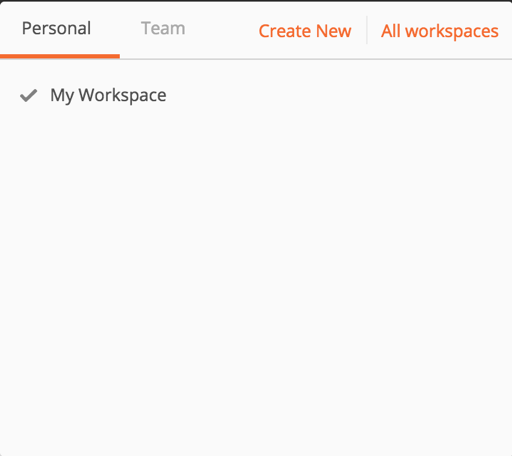 Note that the Invite members to this workspace option is available only for Team workspaces. 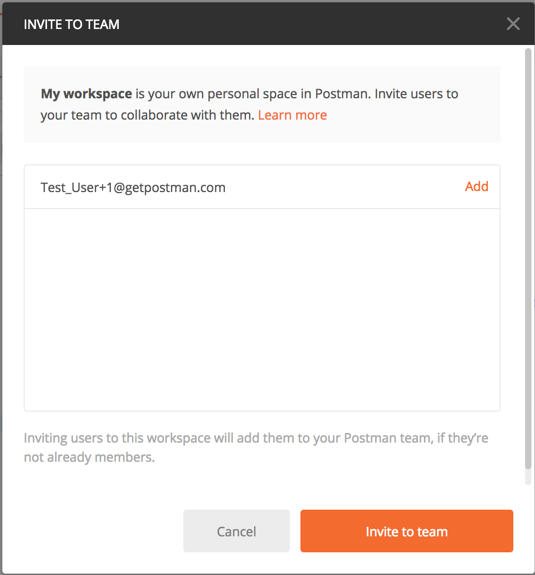 Postman allows you to collaborate with other team members on up to 25 shared requests and an equal number of shared history under the free plan. 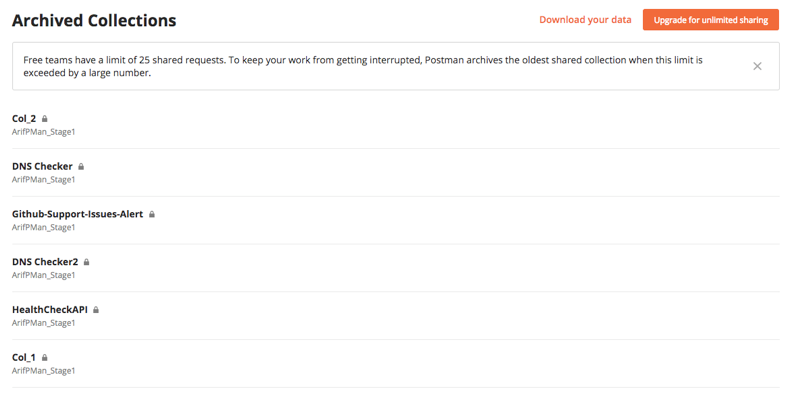 Once you exceed your limit, Postman archives your collections and shared history requests. However, Postman secures your archived collections and provides access to your data with options of exporting and downloading. Also, note that the usage limit does not apply to sharing environments; it applies only to shared collection requests and history. Only the collections that you share with other teams count towards this limit and you can still continue having unlimited collections for personal use. The above screen provides you all the information related to your usage such as shared requests, history, mock usage and so on. 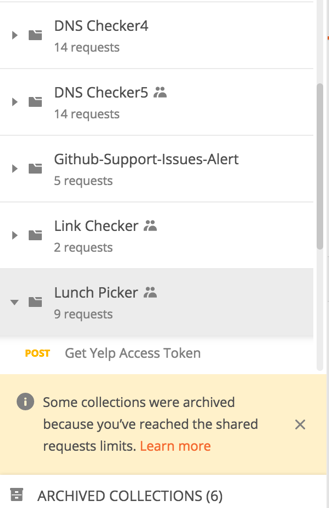 Let’s say you have four collections HealthCheckAPI, DNS Checker, Link Checker, Lunch Picker, and Github-Support-Issues-Alert with each having a set of requests. When you exceed your limit, Postman first analyzes your collections based on the oldest edited collection and archives the entire collection. Assuming HealthCheckAPI is the oldest edited collection (edited about four days ago) for instance, all requests related to HealthCheckAPI get archived. The above screen displays six archived collections. 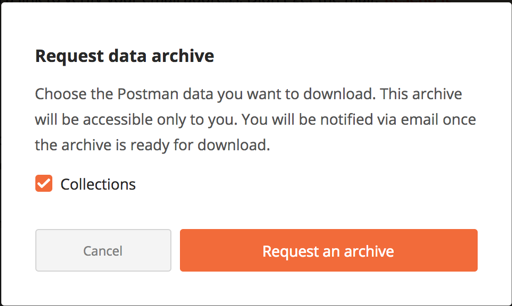 Alternatively, you can also download your archived data directly from the Postman App. To know more about this, refer to Settings section. To download your archived collections, you must choose the second option Download all data including data in workspaces I have joined. The first option in the above screen downloads only your data in personal workspaces.